This week our favorite project is an RFID access control system by Onion’s own Pavel Metrokhin! The project uses the recently released RFID & NFC Expansion to scan RFID tags and triggers an electronic lock to open when a trusted tag is scanned. The project uses an Expansion Dock, Relay Expansion, OLED Expansion, RFID & NFC Expansion, a 12V Solenoid Lock and a 12V Power supply. The Omega holds a JSON list of trusted RFID tag IDs and everything else is controlled by a Python program that constantly scans for RFID/NFC tags and triggers the lock when a trusted tag is scanned. The Hackster post covers all the steps and will guide you through the hardware setup and software installation. You can find the source code on our RFID-Access-Control GitHub repo. So that’s that! A single command to run and voila, you have an electronic lock secured with your RFID tag. Now you just have to find something to keep safe! Last week, we released OnionOS, our all new web-based, graphical user interface. This week, we’d like to introduce a new OnionOS App: the Battery Level Monitor, for use with the Power Dock 2. 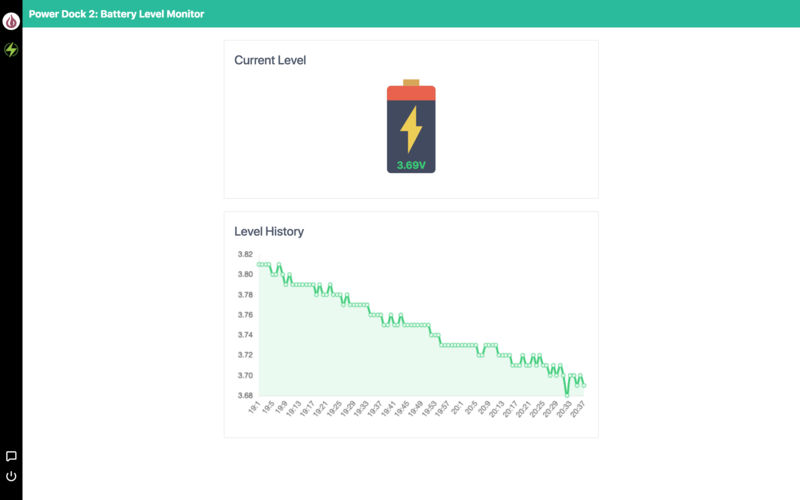 The App displays the latest battery voltage and a chart of the battery level for the last 24 hours – allowing you to visualize your battery usage. Once a minute, the App will talk to the Omega and grab the latest available readings. Make sure to subscribe to 2-Bullet Tuesday to get technical tips about using the Omega, projects created by Omega2 users, and, occasionally, special promotions for the Onion Online Store sent directly to your inbox!